The new rage right now is everyone is calling looking for gun holsters for the Glock 43 and they aren’t happy to hear that there’s not much out there “yet”! We actually called up Fobus Inc. to find out production dates for the Glock 43 holsters and they told us they are 2 months out. With the way the gun industry is now, there’s a variant of just about everything and it’s a bandwagon I’ve personally failed to jump on. I’m pretty happy with My Government Model 1911s and Glock 19’s and J-frame revolvers and never jumped on the .380 craze that has gone on for the last several years. Ballistics are improving which is why so many have been considering smaller semi-autos, but Glock knew that not everyone was going to be happy with a Single Stack .380 gun and that’s why the Glock 43 was released. I think the .380 has improved so much that I don’t think it falls in the category of “under-powered” like it use to, but that great gun show purchase you got might not be your carry gun if you didn’t research what holsters you could get for it. There are always custom kydex companies but expect wait times. Buyer beware of first generation firearms. We’ve been watching the release of the Sig 320 now for over a year and a local Police Department is our primary source of feedback and it seems to be doing well, but there still aren’t a lot of options for off duty carry. We pick up the phone and call manufacturers like Fobus Holsters to get production dates so we can relay that to our customers, but think about modes of carry before you find out you can’t. We recently got some negative feedback about a Fobus holster we sold to a customer and then went back to Fobus’ customer service to find out what the issue was. Apparently there are some fit issues with the different Generations of Glock guns and Fobus holsters so now we have to be more cautious about selling them to customers that walk in and buy them for Glocks. The gun will fit into the holster but the amount of force you need to do to “click” it into the holster and then draw it out is excessive. If you put a hair dryer to the holster and edge something in it you can soften the holster up to get it to fit properly but that’s a headache for a first time Fobus holster customer. In 2013 we’ll probable bring in more of the Fobus E2 holsters because there is more adjustments you can do with the tension. Fobus holsters are the first paddle holsters we suggest to customer if they ask for a paddle holster because after that, you normally have to move up to the $40 dollar range and usually that means a sale for the Safariland holsters. 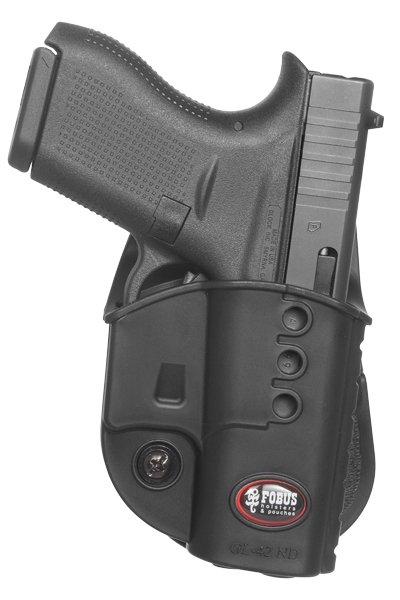 I do like Fobus holsters myself and they are great for winter carry and I normally carry a larger frame gun in the Winter and this is a much more comfortable way to carry instead of IWB. The Sig 226 in .357 Sig is my preferred gun for winter because the more penetration through clothing is something that many of my Law Enforcement customers suggest because of all of the statistics on what happens when bullets go through clothing. I have several product lines that I have brought in for myself just because I knew I would probable end up buying several items from it for my own personal use. One of those product lines is the Fobus one and I can’t say it was because I was a huge fan of the entire product line, it’s just that they make an extremely practical holster for a very low price. I’ve been testing out a Safariland 6378 paddle holster and after a long break in, i do like it but there were some issues originally. I have to say that as far as securing to my belt, I don’t find the Safariland holster to be more secure even though it’s a little more difficult for me to get off. It may sound like a contradiction, but I had some issues with the gun pulling the holster off my belt when i was 90% sure the gun was secure. It hasn’t happened since the holster was broken in, but when the gun was tight, it did happen. The things people have told me they don’t like about the Fobus paddle holsters is they aren’t that strong, well, for most holsters, if you pull on certain parts of them, yeah, they can break and Fobus holsters aren’t exactly built like a tank. 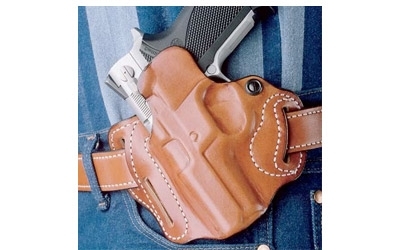 I do think that they Fobus holsters that are the paddle design are very good for IDPA, winter carry, or even for your first 2 day training course. Paddle holsters always seem to be more comfortable than IWB , but they aren’t always as secure. 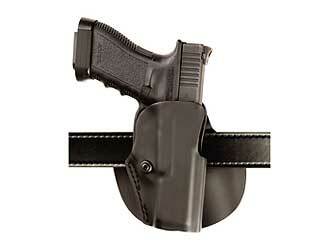 Some of these holsters can be had with a belt loop design, but I’m not a huge fan of those. If you know people are complaining about the lack of retention or adjustable tension, check out the Fobus E2 holsters, the bad thing about those is they aren’t making them for too many guns. Summer and Winter carry and when do paddle holsters work? There are some really big differences between each type of paddle holster and not all kydex qualities are the same. I’m not a big fan of kydex holsters that don’t have metal clips. I tested out a few styles and most of them failed. Even with a good gun belt some holsters will eventually wiggle off the guy when you are crouched in certain positions. I had a Sig 239 pop off a belt when I was bending over and that caused serious concern. All of the Law Enforcement officers in our store have caused for concern about having guns that don’t have sturdy holsters securing them and for Police, getting killed by your own gun is something that statistics show does happen. There is a level 2 holster from Fobus that is a thumb drive design. The Fobus DB series of holsters is a thumb drive holster that also can be locked and this prevents anyone from just being able to hit the release button and then pull the gun out. In a recent discussion with Fobus holsters about expanding our product line, we got feedback from corrections officers and prisoner transports. They informed us that it’s not that uncommon for bad guys to already have handcuff keys or to know how to pick handcuff locks and many of those same people are going to know how to release a Safariland retention holster or a Blackhawk Level 2 holster. 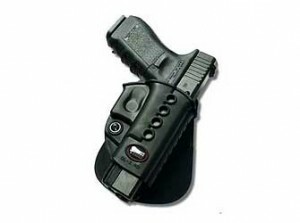 Level 3 is a life saving holster design and one that gives lots of confidence. Quick fixes for first time gun owners? We get new people in our store every day and many of them come in looking for gun holsters right after they walked out of a gun shop. There aren’t very many gun shops that carry all of the holsters and gear that people are demanding. Many gun shops don’t want to touch clothing or certain accessories because the amount of stuff that you need to know to get a gun put together properly is a lot. There are so many things you can do to a firearm and it’s best to get an experts advice before making any major changes. When it comes to concealment options for firearms, think about what you want to do, and then ask questions from someone has been doing it longer than you. Recently there has been an uptick in the number of people that are looking get firearms and I guess it’s not all politics, it’s more to do with the economy and people with a bit of foresight. 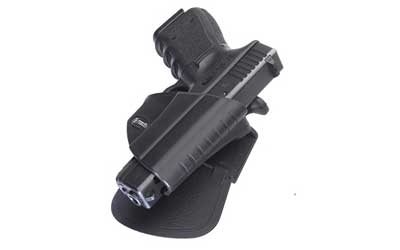 We are a stocking deal for the Fobus holsters which are for just about all of the major manufacturers. Glocks work very well with the Fobus paddle holsters and the E2 version is a good improvement over the prevous molded design since there is an ability to adjust the tention as you see fit. Temperature changes can also affect how your holster handles the gun so think about that before taking a screw driver to the holster.